On Monday, February 27, two mayors of two very different cities will share their experiences in leading their communities forward to meet 21st century challenges. Rochester Regional Community Design Center presents “Getting It Done,” a presentation and discussion with William Fulton, Fmr. 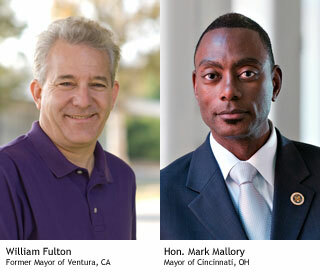 Mayor of Ventura CA., and Mark Mallory, Mayor of Cincinnati, OH. Facing issues similar to Rochester including public safety, economic development, the environment, educationand youth employment in an era of reduced funding and resources, both leaders have been effective and instrumental in making positive changes and spurring collaborative efforts in their cities, succeeding in producing nationally recognized results.